The last thing you need in your day is another pill. According to the Centers for Disease Control and Prevention (CDC), over 23% of Americans take three or more prescription drugs regularly. And if you’re living with diabetes, that number could be even higher. What if I told you there’s a pretty good chance you might be able to get rid of at least one of them? Metformin is a popular drug used to treat the symptoms of type 2 diabetes—a condition affecting more than 400 million people worldwide and about 30 million in the United States. The problem, of course, is that in order to get its benefits, you may have to suffer through some severe and uncomfortable side effects, including stomach pain, bloating, and diarrhea. What’s even worse is that it can’t be taken by people with poor kidney function, one of the hallmark complications associated with type 2 diabetes. 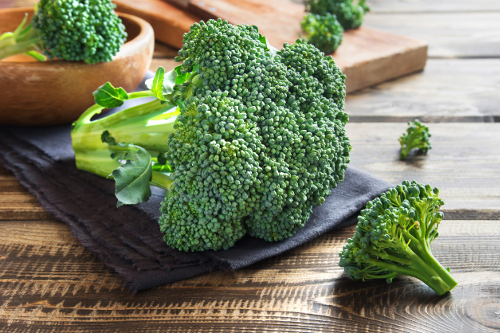 A team of researchers recently looked at how concentrated dosages of sulforaphane—a compound found in cruciferous vegetables like broccoli—can influence diabetes-related genes. In examining a variety of liver genes (about 50) and 3,800 drugs, they saw that broccoli could vastly improve insulin response. Insulin response is central to type 2 diabetes. It regulates blood sugar levels by transporting sugar to cells in healthy people. In diabetics, however, the system breaks down, leading to dangerously high and low levels of sugar in the blood. Following successful lab tests, researchers reviewed the effects of concentrated liquid broccoli shots taken orally in people. For the study, published in Science Translational Medicine journal, 97 Swedish type 2 diabetics were given either the broccoli drink or placebo for 12 weeks. And it became clear that the broccoli extract was quite effective at reducing blood sugar levels, while producing none of the nasty side effects. Does this mean that you should run to the store and buy up all the broccoli? While I’ll always advise including more healthy green veggies in your diet, the drink used in the study contained about 100 times the amount of sulforaphane found naturally in broccoli. In order to get the same amount, you’d have to eat 11 pounds of the stuff per day. So, although including more broccoli and other green veggies in your daily diet can help regulate blood sugar spikes and encourage a healthier internal environment, you’ll have to wait for these concentrated dosages to become available. As of now, there isn’t a time frame for when this will happen. But the results of this study lead me to believe they could be on the way soon. “Therapeutic Drug Use,” CDC, May 3, 2017; https://www.cdc.gov/nchs/fastats/drug-use-therapeutic.htm, last accessed June 30, 2017. Dengler, R., “Tired of taking pills for diabetes? How about a shot of broccoli?” PBS, June 17, 2017; http://www.pbs.org/newshour/rundown/diabetes-metformin-broccoli-treatment/, last accessed June 30, 2017. Axelsson, A.S., et al., “Sulforaphane reduces hepatic glucose production and improves glucose control in patients with type 2 diabetes,” Science Translational Medicine, June 14, 2017; DOI: 10.1126/scitranslmed.aah4477.